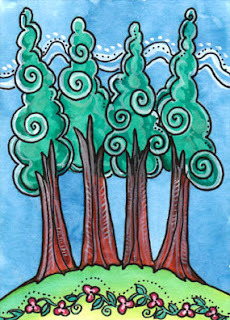 Today's Draw: Four of Wands from the Tarot of Trees. What thoughts or attitudes are standing between you and the feeling of freedom right now? What do you think those thoughts or situations are trying to tell you? Are you willing to start letting go of that right here and now? The Four of Wands is a card of celebration and excitement. It can speak of a victory along a certain path. Not a final victory, but one that feeds your momentum toward a desired outcome. 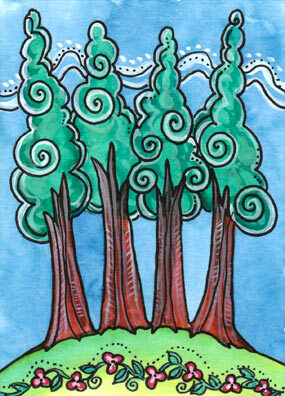 As you see in the card, the sky is blue, the trees are peppy and everything is thriving. It's interesting to note the artist put an element of letting go in this card, too (which seems to be the week's theme). While the other cards this week have dealt with letting go of a wounding, letting go of a situation and letting go of control, this is about letting go of the thoughts, attitudes, issues and outlooks that bind you and keep you from breaking through to freedom. For people on a path of personal development, it can seem like our whole lives are about letting go of things. As we progress, we let go of the need to please, for example. Or engaging in dramas. Or taking things personally. But as you know, these things don't happen in a day, rather they are processes we work on over time. And the universe is very kind and generous in giving us copious opportunities to hone our skillz. If we're letting go of the need to please, for example, the universe may hand us a sparkling array of situations in which we are tempted to stick with our "yes, yes" habit, but can practice breaking it with a solid "no". Once we get our "no" on, the universe will up the ante with a situation or two that's very hard to say no to. Pass that test and the universe will try the surprise attack, hitting you when you least suspect it. Pass that test and one day you'll be moving blissfully free through your life and suddenly realize that the very people, stimuli and temptations that reigned you in in the past have completely disappeared from your life. Where did they go? Who cares! Lesson over. When we operate from a place of fear, which we do from time to time or situation to situation, we will often misinterpret the universe's messages. If we're feeling unloved, we think the universe is telling us we're unlovable. But what the universe is probably telling us is that it's time to open ourselves to all the love that's around us. If we're feeling criticized and judged, we think the universe is telling us we've done something to deserve it. But the universe may actually be telling us is that it's time to start believing in ourselves more. And if we're feeling beaten down by life, we may think all hope is lost. But maybe the universe is giving us an advanced lesson in gratitude or...coincidence?...letting go and letting God. If misinterpreting the universe's message to us is the one thing we let go of in life, can you imagine how freeing that would be? If we could clearly trust and believe the universe is on our side and lighting the path through a dark forest, what thoughts or issues could possibly hold us captive? From someone who has traveled a long way on that path (but still has miles to go) I can say for sure it delivers not only the contentment suggested by the traditional meaning of this card, but freedom from many of the fears, thoughts and issues that keep us down. So what's keeping you down lately? And how can you change your thoughts about it so it honors and includes the higher wisdom and unconditional love of the universe?